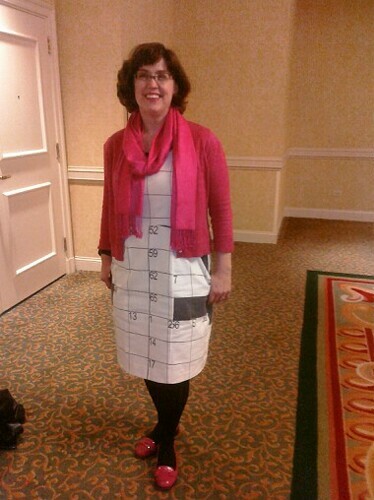 here's my dress from the 2010 American Crossword Puzzle Tournament. I broke 500 for the first time! You look great. That fabric rocks. Way to go on breaking 500! Im going to have to make me a Heidi dress. Looking forward to more pictures of this dress. You look so stylish. Love the loafers and the accessories. I just downloaded the Heidi but havent taped it together yet. This is a really cute dress. That is awesome. So what were the comments from the attendees?? Awesome, right down to the pink penny loafers. You really know how to pull off a great look! awesome! the pink looks great with it! You always rock the crossword fabric – loved the pink accents, too! Glad I could help your blogging efforts by taking the photo – I look forward to checking regularly to see what neat dress you discover next! See you next year! As glamorous as you are intellectual! Great dress! And I agree with Lorene – would love to see more photos of this dress, without the cardigan. Ah, a fellow cruciverbalist and a seamstress! We should really do lunch! Makes me wish I had a big magic marker to start filling in the answers! Im a crossword puzzle addict! What a fabulous outfit. Were completely in love! You look absolutely adorable. This is the best crossword dress Ive ever seen! And all the others have been yours, come to think of it. Fantastic fabric! Excellent scale! That dress alone makes up my entire smile ration for the day. If not the week. Thanks for sharing! I wanted to say I have left you a Sunshine Award on my blog (http://plookiss.blogspot.com/) for you to pick up for having a great inspired blog.Thank you and keep up the brilliant work! Erin you look great! I seen you in another dress like this one; you were standing in a lobby (perhaps a hotel lobby) with black pennyloafers and you had your hands in your pockets. You look great!